questions about his path from junior sailor to the youngest skipper in the upcoming round-the-world race. 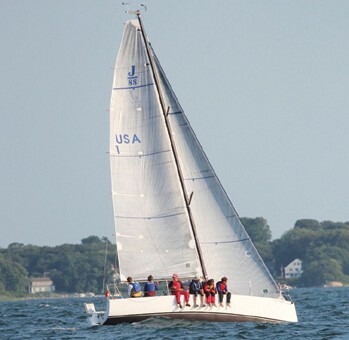 Although owner’s representatives and safety advisors are aboard for the race, 70% of the crew must be under 20 and boats must be raced by the juniors. At the awards ceremony, a leader from each boat recounted his or her experiences. Patrick Rose, skipper of Bob Goodwin’s Beneteau 32 Irukandji (Fishers Island YC), was surprised to find ebb current in The Race more than 1.5 hours after the predicted time for flood to begin. Later that night, juvenile dolphins frolicked around the boat west of Block Island. Annie Hughes, skippering Tim Ryan’s Quest 30 Quantum Leap (Pettipaug YC), explained that her crew fought current and light air through five or six tacks on the last half-mile to the finish off Seaflower Reef, losing about five minutes and finishing just over four minutes behind the winning boat, Rod Johnstone’s J/88 Jazz (Wadawanuck Club). Because skipper Ben Wilkinson was unable to attend, Johnstone retrieved the prizes while praising the training and competence of the junior crews. Crews must demonstrate ability to rely on traditional navigation in case of electronic failure, and a Navigators Prize is awarded to the best navigator, based on charts, logs, and other papers supporting their decisions. This year’s winner is Sammy Burnham on Irukandji. « Kids on Boats, Again…or still?